That’s the analysis from one who knows. Jimmy Crowther was a champion rodeo bull rider. He became a rodeo producer-stock contractor. Finding bucking bulls with sufficient ability to meet Crowther’s expectations to put on quality rodeos became difficult. “I decided to start a breeding program to produce my own bucking bulls,” Crowther reflected. A pioneer in that endeavor, Crowther has produced a number of the best bucking bulls in the world. Today with his family, Crowther owns JC Rodeo Company and New Frontier Rodeo Company with locations at Roxbury and Gypsum. He’s supplied personally bred and produced bucking bulls at 25 events throughout the Midwest this year. “These are the best bulls I’ve ever raised. The difference is everybody else has top bucking bulls, too,” Crowther evaluated. Other breeders are “outcrossing” their bucking bull cowherds, with the “freaks of nature” becoming the “Super Stars,” Crowther clarified. Most of the calves produced by Crowther become bull riding performers. “They all buck successfully at some level. Not all are National Finals quality, but they’ll sure buck off cowboys at the amateur rodeos,” he verified. An opportunity to see the “best in action” will be at the seventh annual Flint Hills Bull Blowout Saturday evening, Sept. 10, in Strong City. “We’re excited that New Frontier Rodeo Company will again be contracting our bulls,” said Kim Reyer, who with his family, has organized the competition. Top cowboys from throughout the Midwest are anticipating the event for the quality of livestock they’ll be mounting. “These cowboys know the bulls have to buck, or they can’t win a check. So, they’re anxious to come get on bulls from Jimmy Crowther’s program,” Reyer verified. However, as special incentive this year, a $1,000 bonus provided by Reyer’s Country Store and Flint Hills Genetics, Reyer’s personal family bucking bull operation, will go to the champion bull rider. “We’ve also had a number of businesses throughout the area step up to help with sponsorship,” Reyer appreciated. With a “Plummer-based cowherd,” renowned as bucking bull seed stock, Crowther uses proven bucking bulls and producers for mating. “We have done some artificial insemination, but conception rate is low. These cows get pretty excited, really upset when we put them in the chutes. Their adrenalin is super high, which is highly detrimental to getting them with calf,” Crowther clarified. Embryo transplanting cows out of top matings has been done, but also with limited success. “Nature’s way works best to breed bucking bulls,” Crowther said. 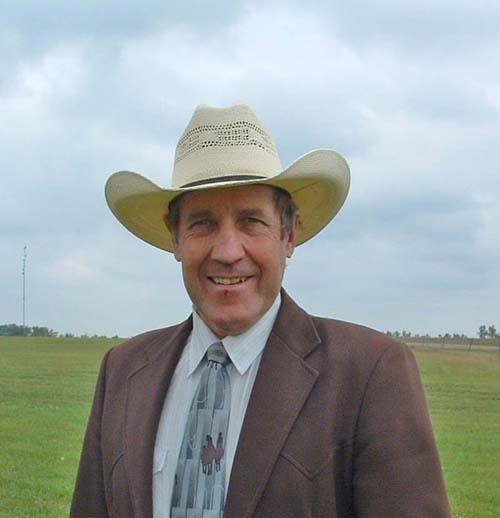 With his four decades of breeding bucking bulls, Crowther knows the cows and their lines that produce the best buckers. They’re mated to proven bucking bulls that sire bucking bulls. “Dark Shadow was a tremendous bucking bull in his own right. There were only a couple of qualified rides on him in his lifetime. His sons are really buckers, too,” Crowther confirmed. A couple of Dark Shadow’s sons, Rangatang and Vegas, are also being used as service bulls. “In order to not get these bulls inbred too tight, we have been mating to outcross bulls. One Crazy Train son seems to be producing some excellent bucking bulls,” Crowther confirmed. “We also mate a few young bulls that haven’t been in the bucking string yet. They’ve really bucked outstanding with the dummy,” he said. “Then, when those bulls prove themselves bucking in the arena, we’ll have their calves to market,” Crowther pointed out. Having produced bulls of National Finals Rodeo (NFR) quality, Crowther sent a bull call U R Next there last year. “He’s out of Rock, a half-brother to Dark Shadow on the maternal side,” Crowther said. That NFR bull has only been qualified on twice, and will be mated this fall. Bucking off cowboys is the job of bucking bulls, and JC-New Frontier bucking bulls are doing their job well. So well that there have been no qualified rides in the last five rodeos-events where Crowther supplied the bulls. “Who’ll be the winner: bulls or cowboys?” That’s a question for the Flint Hills Bull Blowout at Strong City Saturday night, Sept. 10. Of course, Crowther is cheering for his bucking bull production. Additional evening entertainment includes a barbecue supper, mutton busting (sheep riding) for the little kids and a chicken scramble that’s always proven a popular fun time from the serious side of cowboy vs. bucking bull.